Presenters have been encouraged to place material they want to share with attendees in a shared Google folder. This makes it easy to find resources for sessions you attend (or sessions you were unable to attend.) Go to the Presenter Resources folder to find the presenters' folder organized by last name. If a presenter is presenting multiple sessions, inside their named folder is a folder for each of their sessions. You can also click the Presenters Resources button on the right side of the home page. 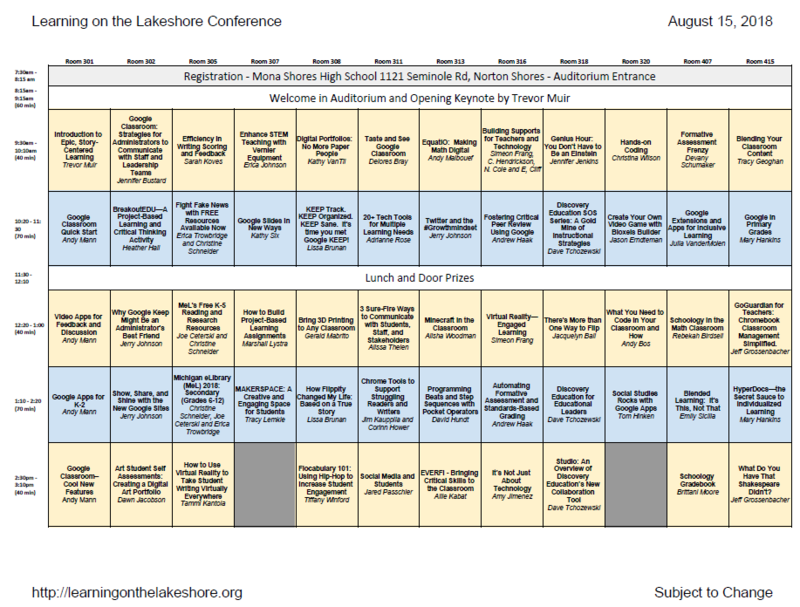 Help plan the sessions you will attend using the downloadable conference schedule. Most rooms are about the same size, seating approximately 32. If you believe a session will be popular, you are encouraged to get to the room early. The schedule is subject to change. The links below will each open a new Google Document listing examples of breakout sessions identified as fitting a specific interest or grade/curriculum area. This is a sample and may not include every breakout sessions which may fit a group. At the conference, you may choose from 60 different presentations - with three 40 minute session blocks and two 70 minute session blocks. There is something for everyone. Breakout session presenters, titles and descriptions can be found at: LOTL 18 Breakout Sessions ​(subject to change/updates). Muskegon's famous Shoreline Inn is offering a special LOTL group rate for a standard room is $119/night (plus taxes and fees) for August 14 and/or August 15. To receive this rate, reservations must made by July 24th. For hotel reservations contact the Shoreline Inn at 231-727-8483. The block is listed under "Learning on the Lakeshore". Two on-site restaurants include The Lake House Waterfront Grill for lunch or dinner, and the Lake Effect Bistro for breakfast and dinner. The Inn is family friendly with complimentary Wi-Fi, an indoor pool, two hot tubs, fitness center, and pontoon/kayak/bicycle rental. Breakfast is available for $8.99 per guest. Registration is in the auditorium lobby. Recommend participants park on the east lot next to the auditorium. We are excited to be able to have Trevor Muir, as the 2018 LOTL Conference keynote. Join Trevor as he shares how educators can shape their classrooms using the power of storytelling and brain science to achieve real student engagement, and in return, learning that is permanent and memorable. Any teacher, in any subject area, and in any grade level can use these practical and proven practices to transform their classrooms into settings where students are engaged, challenged, and transformed. Below is his keynote title and description. Storytelling is one of the most powerful tools in the human arsenal. For most of human history, stories have been the primary means in which people have passed down knowledge, technology, culture, religion, and entertainment. Neurological research has even found that storytelling has permanent, lasting effects on the brain; more than any other form of communication. This power of story needs to be harnessed in the classroom. Trevor is a teacher, author, international speaker, and project based learning expert. He is the author of The Epic Classroom: How to Boost Engagement, Make Learning Memorable and Transform Lives, a book about using the power of story to make learning engaging and unforgettable. Trevor is a faculty member for the Buck Institute For Education, and is the host and creator for the We Are Teachers show, Teacher Helpline Live. His writing has been featured in the Huffington Post and EdWeek. He gave a TEDx Talk titled, "School Should Take Place in the Real World," at TEDxSanAntonio. Trevor runs the Facebook page, The Epic Classroom, where his videos have been viewed over 22 million times.